Car is getting worse, much worse!. I am pretty confident it is the front right hand side . Last edited by biffta; 02-27-2019 at 06:54 AM. It's getting worse! , steering feels like it's wandering slightly and not a nice sure steer. Vibration/judder (still no noise) is getting pretty constant . I do get the odd flunk still going over bumps. I am convinced it is coming from drivers side front ( in UK that is the front right hand side and the longer driveshaft with the intermediate joint). I know my bottom swivel hub ball joints are pretty knackered , so I have ordered two Delphi ones along with drop links and anti roll Bar bushes. I am going to order a drivers side Shaftec reconditioned drive shaft ( approx £175 delivered) . The lady at the car suppliers says they have previously sold 6 Shaftec units for Honda CRV and never had any problems . I'm hoping I make that a lucky 7. The Shaftec drive shafts are genuine Honda ones that are stripped and refurbished and carry a 2 year , 24,000 mile warranty. Not bad at £181 delivered next day. I ordered from a company in Exeter, Devon called parts in motion. They have been excellent and keep you informed about your order every step of the way. I asked them a few questions prior to purchasing and they were VERY responsive. The new shaft comes with a new axle nut. I fitted the shaft ,right hand side ( drivers side here in UK) and it's the shaft that connects to the intermediate or "half shaft" bearing. Fitting was a complete doddle, hardest part was removing the engine splash guard. You tap the inner metal shroud closest to the half shaft bearing , from the opposite side of the car and a few taps with a hammer onto my jack handle bar and the shaft was out. I did find that removing the shock absorber and spring made it much easier to line up the replacement shaft to tap the new one in ( put old nut on end of axle, keep axle nice and straight and tap in until click heard. I replaced my bottom swivel hub ball joint ( right PITA to do) , drop links and anti roll bar bush while I was on that side. Steering is much smoother and true due to ball joint etc. Juddering is just as bad! ( what a fail!). Last edited by biffta; 03-05-2019 at 05:47 AM. I took car to a clutch and gearbox specialist (Ellesmere Port Gearbox and Clutch Centre ) ,they were only 20 minutes drive from me and said just pop round and they will take it for a test drive . These guys have been doing clutches and gearboxes for 33 years and know their stuff. I turned up and a guy jumped in my car immediately and drove off , ten minutes later he returned and said there is zero problems with neither my clutch, the flywheel or the gearbox ( phew). The guy reckoned the vibration was coming from the left hand ( passenger side here in UK) . I asked them ( for future reference) , how much a LUK DMF and clutch would be fitted inc vat. It is £860 all in inc warranty. They will even collect your car and return the same day. Not bad at all really. 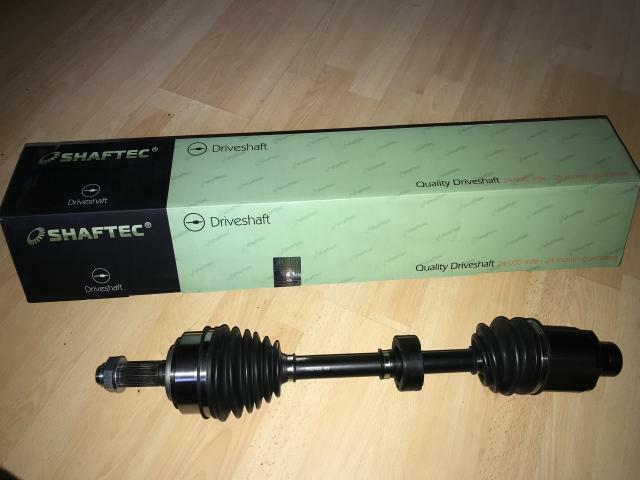 I get home and order the passenger side Shaftec drive shaft from parts in motion and pay the additional £5 for next day FedEx deliver ( just over £181 delivered). I shuffled my work shift so I would be off today ( work tonight), so I would be in to collect the drive shaft and fit it. 9.20am and a van pulls up outside and I thought here's my drive shaft already!. The driver posts a flat piece of card through the door with a delivery note on it. I thought it must be something my lad has ordered. Nope, it was the outer address sleeve of the driveshaft, the guy had delivered me the label without the box containing the driveshaft!. As soon as I realised what had happened I got in the car and set off to find the delivery van. I found the van and driver delivering to a local pub and explained to the driver the problem. We both checked his van and it was not in there. The driver got on the phone to the local FedEx depot in Sandycroft and I spoke to them on the phone and explained what had happened. It was fairly cold and I had rushed out in just a t shirt and was put on hold for ten minutes while they searched at the depot for the driveshaft box. Once home I have got on the phone to parts in motion and they are chasing it up with FedEx and have already emailed me twice. The bummer is that the weather has been temperamental of late and today is blue sky and sun. Last edited by biffta; 03-05-2019 at 05:56 AM.